Conductors in electrical systems should not be sized with voltage drops exceeding 3%. For a 12V system the maximum voltage drop should be less than (12 V) x 3% = 0.36 V.
Note! Failure to use an adequate size may result in a fire. Always secure electric wires with fuses. Note! Wire size based on 3% (0.36 V) voltage drop in a 12 Volt circuit. Always oversize wires if voltage drop is critical. The maximum current in a 12 V gauge #6 (13.3 mm2) cable with length 15 m is approximately 15 amps according the diagram above. The maximum current in a gauge #10 (5.26 mm2) cable with length 15 m is approximately 5 amps. Engineering ToolBox, (2004). Amps and Wire Gauge in 12V Electrical Circuits. 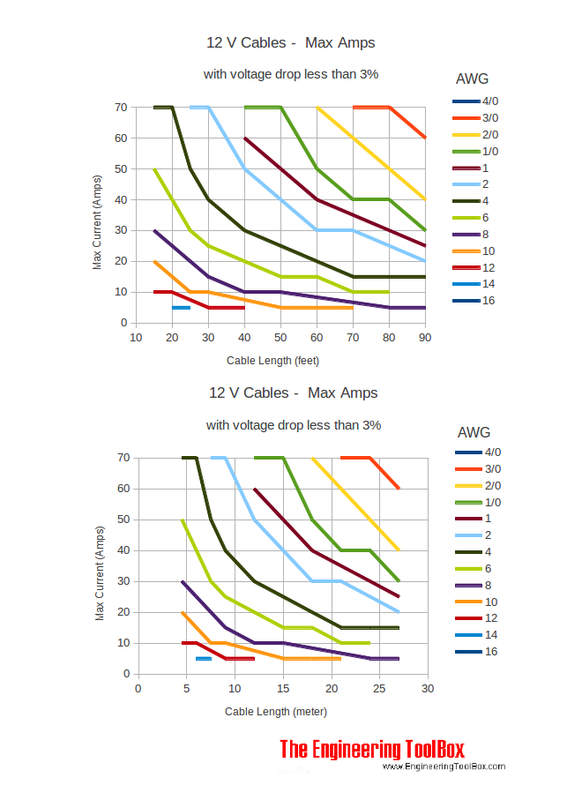 [online] Available at: https://www.engineeringtoolbox.com/amps-wire-gauge-d_730.html [Accessed Day Mo. Year].